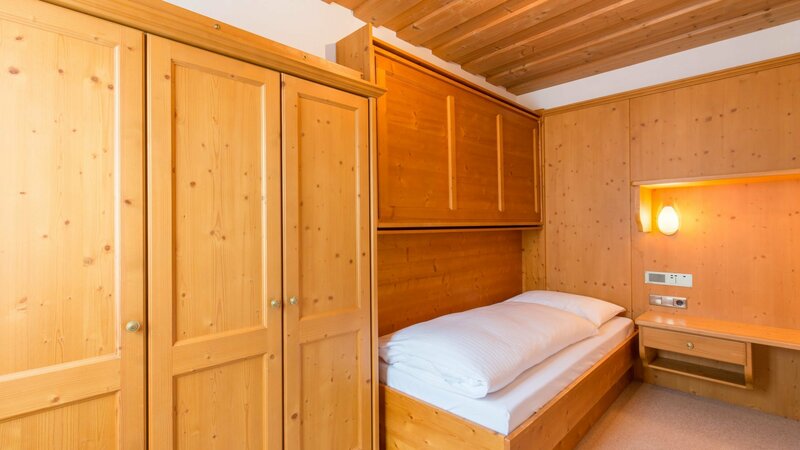 Some rooms can be combined with double room Zillertal. Room no. 218 is wheelchair accessible. Alle Preise in Euro pro Person und Tag inkl. Halbpension plus und aller Steuern, exklusive Ortstaxe ab dem 15. Lebensjahr. Prices are in Euro per person and day, incl. gourmet half board plus and VAT, excluding local tax for all guests aged 15 years and over. *) Inkl. Kindermenü. 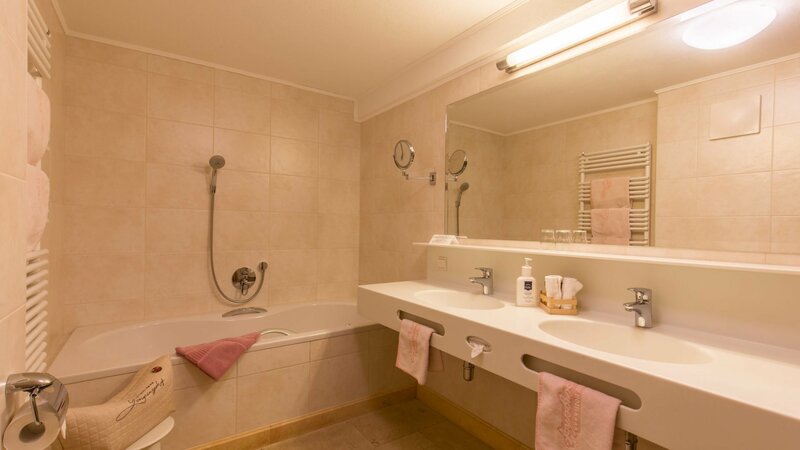 Kinderpreise in Euro pro Tag im Elternzimmer bei 2 Vollzahlern im Doppelzimmer bzw. 1 Vollzahler im Einzelzimmer. Kinder bis zum 12. Geburtstag im eigenen DZ erhalten 20 % Ermäßigung. *) Incl. childrens' menu. Childrens' prices in Euro per day staying in the parents' room with 2 full paying adults (double room) or 1 full paying adult (single room). Children up to 12 years in a separate double room receive 20 % discount. Photos and floor plans may vary depending on furniture and room layout. Feel at home from home. 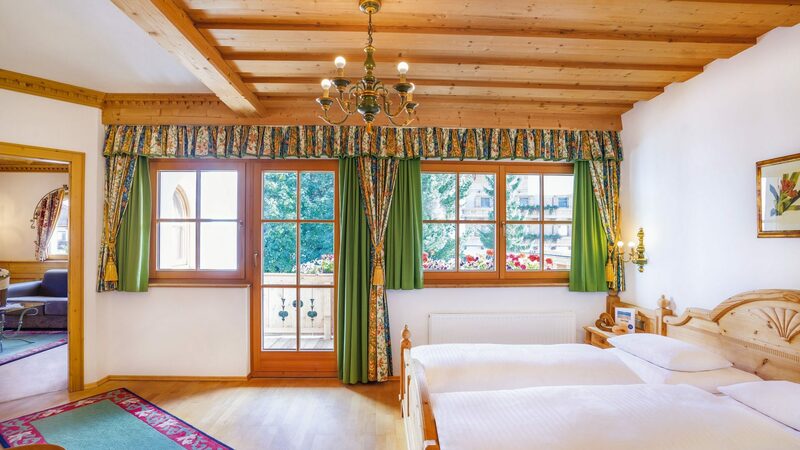 All rooms & suites are traditionally and comfortably appointed. All prices are in euro per person and day incl. gourmet half board and VAT, excluding local tax for all guests aged 15 years and over (€ 1.80 per person and day). Underground car park €10 per night/car. Children’s prices per child/day staying in the parents’ room with two full paying adults. Children (up to 12 years) in a separate double room (limited availability) minus 20% discount. Children up to 11 years choose à la carte from the children’s menu or from the adults’ menu against a surcharge of €10 per meal. Prices for children aged 12 years and over include the Gaspingerhof gourmet half board.